1 ton gantry crane provides an economical and highly efficient way of lifting and moving small and lightweight items. Due to the small lifting requirement, this 1 tonne gantry crane usually comes in single girder design with different options for running mechanism. We supply many different types of gantry crane 1 ton for your wide range of applications mainly including rail mounted gantry crane, portable gantry crane, adjustable gantry crane, fixed gantry crane, aluminum gantry crane, steel gantry crane and telescoping gantry crane. Ellsen is a seasoned and reputable gantry crane manufacturer in China. In addition to 1 ton crane, we supply other light duty gantry cranes such as 1/2 ton gantry crane, 1.5 ton gantry crane, and 5 ton crane. We also produce heavy duty gantry crane with capacity up to hundreds of tons to suit large lifting requirement. If you have any need for a 1 ton gantry crane or other tonnages, please tell us your specific lifting requirements, and we are more than happy to help choose the right lifting system for your need. Choosing a right gantry crane for your l ton application is crucial for the success of your business. A proper gantry lifting system can not only help boost productivity, but ensure the safety of crane operators and other co-workers. 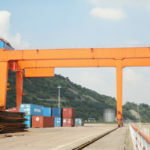 Before selecting 1 ton gantry cranes for your business, it is necessary for you to understand the types of gantry cranes 1 ton and how they differ from each other. With solid A frame and steel construction, this portable gantry crane is a cost-efficient lifting solution with flexible height and span adjustment. You can also choose the fixed type according to your practical needs. The 1 ton adjustable gantry crane makes it easy to pass through a doorway, narrow passage or obstruction so as to achieve a high mobility and wide application. This 1 ton capacity telescoping gantry crane is designed to suit flexible and portable lifting needs. It is widely applied in shop, workstation and garage to complete various lifting and transferring tasks. The telescoping height design means you can adjust the crane height readily so as to adapt for different ceilings or roofs. Thanks to its solid base design, it makes the lifting movement much more stable and easier. This telescoping gantry crane can cover a variety of lifting capacities in a range of 1/2 ton to several tons. We also supply other types of gantry cranes to suit a large variety of applications, such as rail mounted gantry crane. 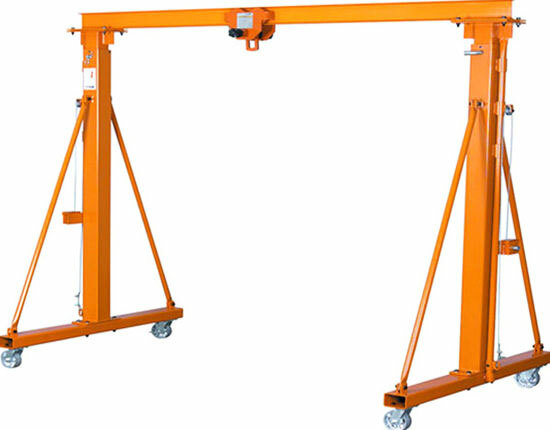 This gantry crane is the most common type of gantry lifting equipment widely used for indoor and outdoor workplaces. It runs by means of a rail or pair of rails mounted on the ground. According to different facility conditions, we have full type gantry crane and semi gantry crane to fit various lifting requirements. The rail mounted gantry crane we produce can reach a variety of lifting capacities to meet large and small lifting requirements. MH full gantry crane is a typical type of single girder gantry crane, which can be used to meet 1 ton lifting requirement. This equipment is served as a regular crane to load, unload and transfer materials in warehouse, workshop, and open yards. The metal structure of this overhead gantry crane is available in box and truss type. 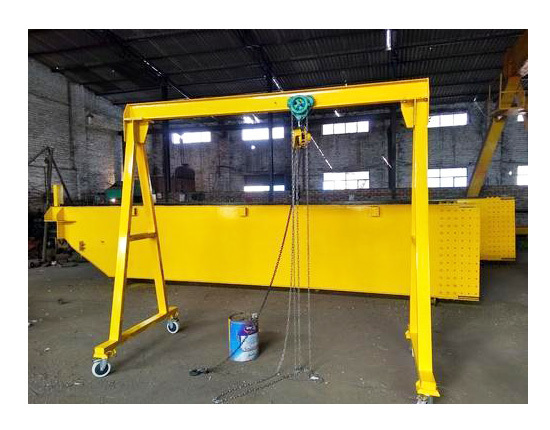 BMH semi gantry crane is another type of rail mounted crane, which is more often used in mechanical shop, workshop, and warehouse to handle small and medium sized loads. It is designed to fit limited working areas. If you have trouble building a full gantry crane within your working area, a single leg gantry crane can be a better alternative. Our l ton gantry crane for sale features good quality and low cost. With regard to different types of 1 ton gantry cranes, we supply various design options for your application, and their corresponding price will also differ from each other. For gantry crane mounted on rails, different types of spreaders and hoists are available for users to handle various materials. Besides, multiple metal structure and cantilever designs such as box or truss structure, with or without cantilever are optional. When choosing a rail mounted gantry crane, you should first determine your gantry crane specification and design in order to specify the most suitable 1 ton gantry crane model for your application. For 1 ton portable gantry crane, you can choose either a fixed one or an adjustable type based on your actual application. Different types of wheels can be selected to fit flat, soft or uneven ground surfaces. The sturdy construction with steel or aluminum makes the movement more convenient and stable. If you would like to know 1 ton gantry crane cost, contact us sales team online today. You will surely get the best price from us. With quick and reliable lifting movement in your workshop, the 1 ton gantry cranes can enhance productivity to a large extent. With CE and ISO approved, our gantry cranes have superior quality with reasonable price. Solid construction makes the movement more secure and efficient. Diversified types of gantry cranes 1 ton are available to serve a wide application. High mobility and convenient adjustment system make it adaptable for multiple workplaces. If you plan to build a 1 ton gantry crane in your workshop, workstation or other places, welcome to choose Ellsen! We are capable of assisting you to build the best lifting solution for your individual need. Considerations involving in building a gantry crane mainly include your building condition like ceiling height, various options for gantry crane components, different operation methods, running mechanism, and things like that. Our experienced engineers are very happy to help you make your own gantry crane plan. As a subsidiary of Aimix group, We are specialized gantry crane manufacturer. We have established a systematic sales network from the gantry crane design, manufacturing, package, shipping to follow-up services including installation, inspection and maintenance. All of our products are fabricated in strict compliance with industrial manufacturing standard as well as under strict control by specialists in our factory. All of these measures are made for the sake of high quality products. Our sales team and other co-workers constantly receive rigorous training in order to provide dependable service as always. To learn more about us and our 1 ton gantry crane, you can leave a message or contact us directly. Looking forward to working with you!